Williams Grove Blacksmith Group - The Iron Forge Fire Blackmithing Forum. If you live the Central PA and are interested in a Blacksmith Group respond to this post. If there is enough interest I will call for a chat room discussion and see if there is a time that will work for most folks to meet at the smitty. The location is the Williams Grove Historical Steam Engine Association in Mechanicsburg PA. If interested in a monthly or quarterly meeting we will organize a regular group meeting. You will be required to join the association for liability reasons which cost about 15 bucks per year. Make sure to check the subscribe to this topic when you post so you can get notifications via email about chat room discussions or smitty meetings. If you wish to start a group.... the successful strategy that others used has been to first set up a regular meeting time and place and invite people. Then have lots of patience, because building a group takes time. Inviting people through the PABA newsletter and large forums to regularly scheduled meetings is what works. Has there been any forward progress in the past four months? We have the Williams Grove Boards approval to organize and meet regularly at the smitty. I'm going to send out an announcement of the first meeting. I expect only a few folks to respond at first but there we can discuss organizing regular meeting including a schedule for those who might want to demonstrate a day or two at some events. I'll contact Keith Eckman from PABA and send a notice to ABANA announcing the group. If anyone else is interested here at the forum please send me a PM. Excellent, thank you for keeping us informed. Unless a family issue comes up, I plan on attending the Pennsylvania Artist Blacksmith Assoc (PABA) this Saturday February 10th, 2018 in Lancaster PA. If you have any information about meetings at the Williamsgrove Steam Association blacksmith shop that you wish me to share with folks at the meeting, such as dates and meeting agenda, please let me know. Please do share. I'll get a date for an organization meeting before weeks end. A family issue came up, so I could not attend the PABA meeting back in February. Any news about an organization meeting date at Williams Grove? No Problem I'll send Keith an Email. Hello everyone. This is in regards to meeting at Williams Grove. All those interested in joining a new blacksmith group in Central PA may find interest in what we are doing at The Williams Grove Smitty. Our first introduction meeting to get going is tentatively planed for two weekends from now. I need to make sure we have access which I'll have knowledge on Monday confirming the ground are opened. So if your interested plan to be there Saturday evening between 6 and 8PM. March 24th and 25th. This is just introduction and an idea of organization. The following day I will be at the smitty from 8 to 12 noon for the same thing. Member will need to join the Williams grove association to belong to the group. it's about 15 bucks. I post a bulletin later on topics to discuss. I plan to have group meeting on Saturday evening where we will discuss group meetings and work on a skill set. On Sundays there will be public spectators and we will practice what we did on the Saturday evening before. We will also create an outline of best practice so we have some organization as well as the best way for communication. I have many ideas I would like to share and I want you input as well. We will plan 1 or two meeting monthly so I will need to know who has a real interest. There are big opportunities for this group on a larger scale to sponsor events if there are enough interested people. The learning will not stop! Hank said above: "I need to make sure we have access which I'll have knowledge on Monday confirming the ground are opened." Were you able to confirm on monday that the grounds will be open at those times.... If those times are confirmed then I will make hotel reservations so that I can attend both meetings. OK, so I talked with Victor(aka Hank). We are dependent on the Steamshow association for when the gates to the Steamshow grounds are open. Victor and I both have four-wheel drive and I have a reservation at a hotel on Saturday evening . I can't imagine that there will be enough snow to prevent the grounds from opening as less than one inch is predicted Saturday morning turning to rain and 46 degrees in the afternoon with rain and snow showers in the evening.... but I am not familiar with what the Steamshow actions and parameters. So, 6pm till 8pm on Saturday evening March 24th is planned for discussions and planning, and Sunday from 8am till about 2pm (when the gates close) is planned for having the forge running. I will bring my tool box on Sunday so that I can demonstrate some stuff oriented towards blacksmiths (unless someone else has the overwhelming urge to do so). Victor has contacted the President of the Steamshow association today and verified that the gates to the grounds close at 2pm on Sundays. The main goal to work towards is to have regular predictable monthly times, in a safe manner, hopefully a demonstration or two oriented towards blacksmiths at the monthly meetings. Another goal includes support and developing a relationship with the Steamshow Association, by providing demonstrators at their events, and by having a hammer-in during that summer that starts out small and grows over time. Please bring your own food, snacks, and drink. Please wear safety glasses. To work at the forge requires joining the Steamshow association for liability and insurance reasons. I have started gathering things to bring to the Sunday meeting. So far I have welded, what I believe to be tool steel, to a length of angle iron, sharpened the steel bit, and sliced the result to about 1.50" inches wide and knocked off the burrs with a file (always run your fingers over an item that others, especially the public may handle). That way, if the shop doesn't have a cut-off hardy, we have something to use in the vise to cut mild steel. I also dug some old chisels out, to demonstrate, if people are interested in how to form tools to hopefully be able to make animal heads. I expect that I will need to cut off any mushroomed chisel heads and prep that end by easing the edges. And just in case those chisels don't work when quenched in water, I plan on bringing some short pieces of water-hardening tool steel. If Vincent feels that it is appropriate, and time allows, then people with a Steamshow membership badge/card and some old chisels or tool steel, may be able (my guess is probably) to try their hand at making tools, please consider bringing some pieces of tool steel (preferably water hardening as the shop only has a water bucket at the moment), safety glasses, hammer and tongs for yourself to use. Hammers and tongs will be available, just not my best ones. Oh, almost forgot. If you want to be able to sit, then bring a chair for yourself to sit in. Always remember safety first, and second to make the Steamshow folks happy. I was supposed to leave on my run 4 hours ago. They still don't have my truck loaded. Even if I can stay awake i still won't make it to the shop until afternoon. I just want to remind everyone of July's monthly meeting this Sunday. Discussion will include the following. 1. Scheduling Smith's for the labor day fall show. 2. Volunteers for constructing shop improvements. When planning shop improvements, please plan for storage space for four semi-portable forges, four portable anvils with stands, blowers, and four or more vises mounted on tractor-trailer brake drums. I am currently working on two forges, and Brian LaGrand is working on a third forge and repairing two anvils. ..... these workstations are designed to be moved out of the shop when in use to provide additional opportunities for people to work at forges, and to allow for offering classes in blacksmithing. My hope is that we could reserve the wall on the left as one enters the shop for storage of this equipment. I hope to have at least one portable workstation ready by the Fall Steam Show.... Constructing these workstations are taking longer than expected, life keeps getting in the way. Anything that people can do to help with this effort, such as repairing/mounting one, or more, of the vises currently in the shop as mobile vises, would be greatly appreciated. Putting tong/hammer racks, and other stuff against that wall is likely to cause difficulties in storing workstations. Having workstations along the wall hopefully will help encourage the steam show association to move forward on plans to either build a storage shed, or expand the size of the shop. So crowding stuff in on that side of the building can have positive results. Then *after* we have improved building size/storage, would be the better time to modify the masonry forge area into two idealized workstations. We need to think at least two steps ahead, not just focus on the needs of the person at the masonry forge. Some thoughts on adding a membership fee at this point in time. - Only Williams Grove (WGHSEA) can take fees due to Pennsylvania law, either the entity receiving money needs to pay taxes on it or be a registered Tax Exempt. That would include book keeping, a bank account, etc etc etc. - The Board of Directors of WGHSEA would need to be consulted so as not to step on their toes. - People have been donating a whole lot of stuff to the effort. --- People are less likely to donate stuff to a group, and/or give massive discounts on stuff for the group, if the group is one that has membership fees. --- What has been and is in the pipe for being donated, far far exceeds what the group could possibly collect in membership fees, even over a 20 or more year period of collecting membership fees. - Collecting membership fees at *this point* is likely to slow down the growth of the group. The fifteen dollars that the WGHSEA collects is about what people expect to contribute when joining a blacksmith group. - More than one blacksmith group has said that the membership fee only covers the cost of printing and mailing the newsletter. My humble understanding is that is pretty much a universal fact for blacksmith groups. Currently we do not have that cost since the newsletter is only distributed electronically. Members of the blacksmith group of Williams Grove. The end of this month the big Labor Day weekend event at Williams Grove and we are looking for volunteers to demonstrate throughout the week. It would be nice to have a schedule filled in the next 2 weeks as well as a few things that need attention in the shop. Who is available for working at the forge for the fall show. We need some volunteers. Hello Everyone in Blacksmithing at Pennsylvania Blacksmiths shop at Williams Grove. I thought would provide a little history of our group. Were we are and moving forward. 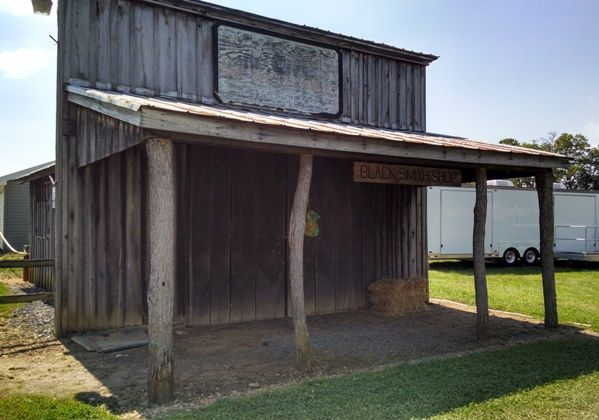 The Williams Grove blacksmith shop has been here for a number of years. About 3 years ago I approached the Williams Grove board and asked permission to start a blacksmith group. At that time Bill Clemens was the association's blacksmith. He was in charge of the blacksmith shop and was the demonstrator for the fall show. However there were other shows available that they could use a blacksmith to demonstrate and I had an opportunity to do that. I believe William also had the same opportunity at some of the other vacant shows. At the Winter meeting of the Williams Grove board they approved the organization of a blacksmith group. I was asked if I could put one together. I was proud to step up to the task. We had our 1st meeting at the end of March with a handful of people who were intrested. There have been 4 monthly meetings which are the official group meeting and is held the last Sunday of each month. There has been positive interest in getting a group together. As with anything new there are growing pains. The group's biggest task at hand as of today is presenting a positive image for the fall show. But equally as important is that we create organization for the group. Guidelines on how the shop works, who's allowed in the forge, when it's open, leadership and rules of conduct to mention a few issues to address. Otherwise we will continue to have unorganized communication. An unclear map of direction and many ideas without a cohesive plan. At this point I think there are enough intrested parties that we can pick a person to be the head of the group. From there we can create a roadmap of where we would like this group to go. There is a lot of potential and I have a lot of things that I believe are positive that are outside of this group that can be brought into making Williams Grove a shining example in the blacksmithing community. So use this thread to express your ideas on what you think we should do as a group. Then we need to have an official meeting and start laying the groundwork to actually making this an organization instead of a loosely knit group of people with a common interests. For the record my name is Victor Plitt. I use Hank Rearden for my online blacksmithing profiles. Hank Rearden is a character in Ayn Rands novel Atlas shrugged. Name of my forge is Galt's Gulch Forge. Hello everyone I hope to see everybody at the forge this Sunday will be doing chisels and tempering. I created a thread so we can photograph and describe what we made and how we made it. Please share with others and hope to see you there. See you at the forge Sunday. Great day at the forge. New people joined and we had lots of activities at the forge. This will be a busy week.